The most famous products of Lefkada are Eglouvi’s lentils, honey from Athani, sausages and wine. Also interesting are the local pies as well as mantolato and pasteli which used to be a specialty of the barbers! Ivari has excellent quality avgotaraho (roe) despite the fact that these are produced in small quantities. Also famous is the embroidery of Lefkada and the remarkable “Karsaniki” stitch (originated from the village of Karia) which doesn’t exist elsewhere in Greece. In the town pies are not so common, while on the contrary in the villages they are ubiquitous and easily made. In addition to the vegetable pie with aromatic wild greens, also worthy of note are the rice pie (rizopita), pasta pie (macaronopita) made with eggs and milk, olive oil and cheese, as well as the ‘briani’, pie made with thick green courgettes. Wine:The most reclaimed, traditional wine varieties that grow in Lefkada is Bertzami and Bardea. Grown on the municipal units of Sfakiotes, Karia, Apollon and Ellomenos at an altitude of 200 to 700 meters and considered among the best varieties our country produces. In recent years, thanks to the tourism development in Lefkada, young winemakers with expertise and modern facilities undertook the task to highlight the local wine varieties, even succeeding special awards at wine fairs. The winery facilities are open to public either directly or by appointment. Handicrafts: But what really enchants the visitors are the handicrafts created by the local women. Wonderful embroideries and woven fabrics known for their beauty. Especially the embroideries from Karia are made with a special technique totally different from any other technique used in Greece. White lace knitting in different sizes and the creation of blankets with designs that have their roots in the Byzantine era are also exquisite. Buy some as a present for your friends back home. Salami and Sausages: The butchers continue, as they always did, to make the speciality air-dried salami and pork sausages. 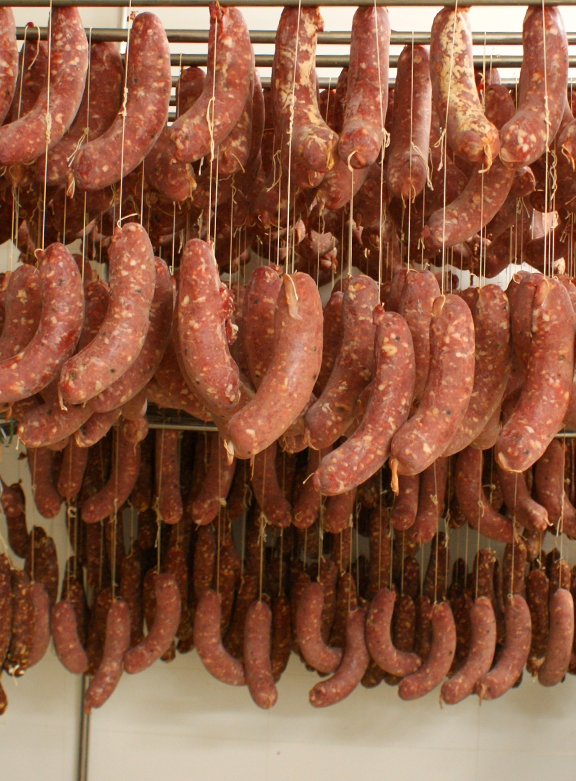 Lefkadian salami with its mild aroma of garlic and with whole peppercorns has been exported since olden times. Lentils: Eglouvi’s lentils is an extremely rare and delicious variety that has been awarded in several agricultural product exhibitions.